DavidNews HYIP blog - News & Reviews: Tea House - No more ideas for legend? Tea House - No more ideas for legend? If you don't know where to find something original or you simply do not trust BTC mining and Forex projects then maybe take a cup of tea and take a look at Sticky listing owner Tea House. Tea House is slightly different project than rest of HYIP projects, and it was added here on 11th of February with $360 reinvestment. 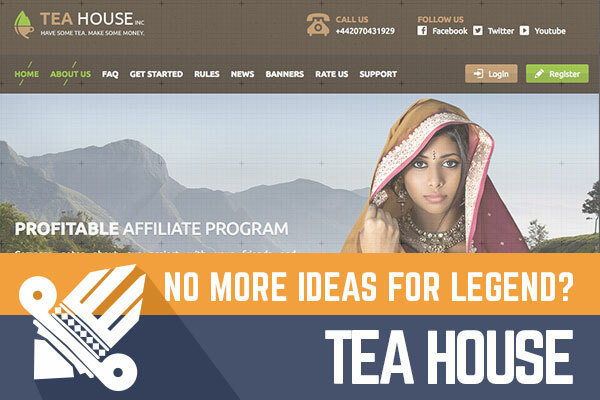 When I take a closer look at Tea House project, it becomes evident that it is a qualitative project and seems that administrator has tried a different approach to generate interest for investors to invest exactly into Tea House. Such approach usually is very risky because no one can predict for sure what does investors will like even how well the project is produced. Overall as we see the development of this project is done on a great level. It has incorporated company, phone support and I see that online chat support is online most of the time. Before we get to talk about investment plans, there is one more thing that I would like to add - the project has been sleepy project earlier. The monitoring time that you see on DavidNews.com monitor is an actual lifetime of this project because as we all know when the project is a sleeper, then nothing much is going on there. So, with this, I simply would like to say that Tea House is a young project. I like investment plans that project offers because even there is many of them you can use only those that are after-one-day investment plans and you can choose to earn with a project only for one day or even for 70 days. Of course, I do not recommend to invest for a longer period than 15 days, but as you know being brave sometimes pays off very well. So, it is up to you, if you want you can risk because theoretically, you can make magnificent profits. In this project, you will be able to invest with Perfect Money, Payeer, AdvCash, NixMoney and cryptocurrency Bitcoin. While deposits will be accepted automatically, it is important to note that withdrawals will be carried out manually, but usually, they are paid in a reasonable timeframe. Overall I believe that it is quite safe to invest in Tea House project because only in past weeks it has started to advertise more heavily. That just mean that new investors will arrive to cover our profits and project will just get more and more popular. Of course, invest with caution and do not invest funds that you cannot afford to lose. Investment plans: 102.5% after 1 day, 114% up to 220% after 5 days, 145% up to 700% after 15 days, initial deposit included in the payment. Ignore other investment plans. Double your claimed satoshis with this amazing BTC FAUCET ROTATOR. If you are trying to BUY bitcoins online, PAXFUL is the ultimate source for bitcoins as it allows buying bitcoins by 100's of payment methods, such as MoneyGram, Western Union, PayPal, Visa, MasterCard, American Express and even exchanging your gift cards for bitcoins.